Install filestack-react and filestack-js through npm. You should register on the Filestack website and get an API key first! Do you prefer a link instead of a button? You can pass a custom prop link. You can also import the official client and decouple its React component ReactFilestack. However, you will need to initialize it with the API key and any client options you need such as security, cname, and sessionCache. You can find the examples of using Pick in /examples/demo. To try different functions go to /examples/demo2 and follow the same steps to run it. required, string. An API key for Filestack. optional, string. default 'pick'. Can be one of pick, upload, transform, retrieve, metadata, remove. optional object. use it to insert a file object in upload mode. optional function. Handle the results after a successful response. optional object. Detailed options to customize the specific mode behavior. For example, for pick mode the following options are supported. the client with a valid Filestack policy and signature in order to perform the requested call. optional string. When using a custom button, you can set the text. optional string. 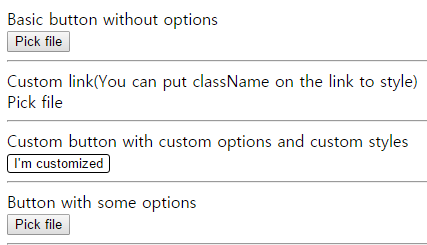 When using custom button, you can set className to style it. optional Custom domain to use for all URLs. This requires the custom CNAME feature on your Filestack app. optional If true then remember users (up to session expiry) when using the Filestack Cloud API. By default users need to authenticate on every pick. A file uploader for react that uploads images, videos and other files to your firebase storage. Load, crop and preview avatar with ReactJS component.